Aman Hotel Sveti Stefan is hands down the best hotel in Montenegro. 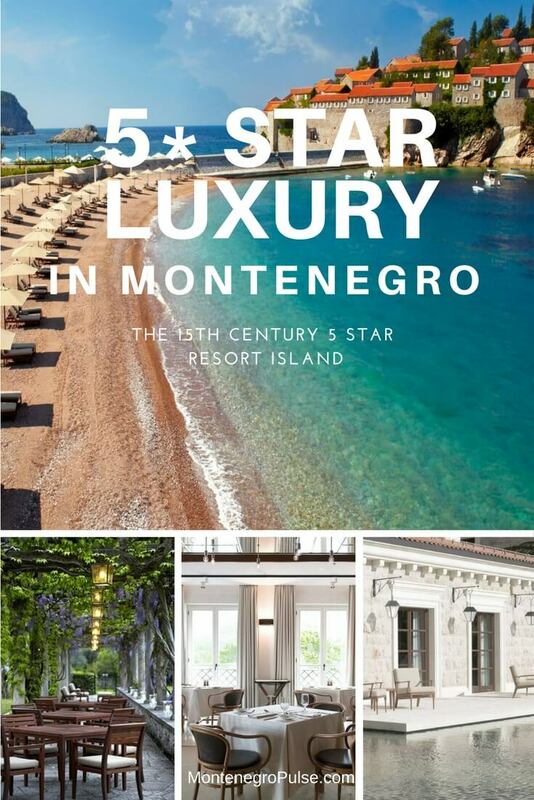 And it’s really the only true 5 star hotel in Montenegro, although others, like Splendid Resort and Spa, also have 5 stars. Not only is it a 5 star resort, the location is utterly unique. The resort is made up of a 15th century islet, which is a UNESCO World Heritage site, and a former royal palace. All set among 800 olive trees on the stunning Budva Riviera. It doesn’t get more picturesque than this! And as a guest, you have access to private beaches, an expansive forest park and all the luxuries that come with a 5 star resort. 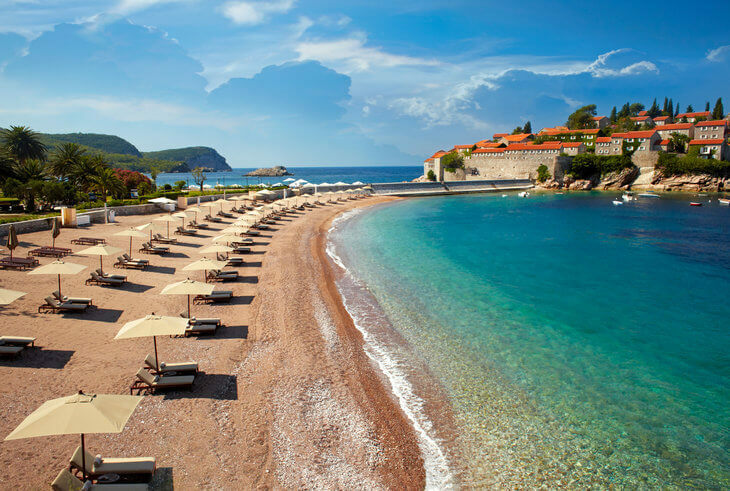 But that’s not to say Aman Hotel Sveti Stefan is perfect for everyone. Travellers who are experienced with the Aman brand are quick to say that Aman Sveti Stefan doesn’t completely live up to Aman’s usual impeccable standards. Some have brushed this off and focused on what they loved about it, and others have been disappointed. Sveti Stefan isn’t just a stunningly beautiful islet on the Montenegrin coast… It’s also got an illustrious history which includes pirates, an invasion and naturally, victorious locals! As the tale goes, back in the 15th century, the Ottoman Turks tried to invade Kotor. Never ones to leave their neighbours high and dry, locals from all along the Budva coast gathered their arms and went to help battle the invaders. With the gold and spoils from the defeated Turkish ships, the villagers from Sveti Stefan decided to build a fortress on the islet. There were 12 buildings – one for each tribe – and a church dedicated to Sveti Stefan (Saint Stephen). By the 1800s there were 400 people living on the island, but by 1954 there were only 20 people living there. So in the 50’s it was renovated and in 1960 it opened its doors as Hotel Sveti Stefan. Hotel Sveti Stefan quickly became a favourite with people like Sophia Loren, Princess Margaret, Doris Day, Kirk Douglas and Elizabeth Taylor. In the 1990s, with Yugoslavia’s break-up, the hotel fell into disrepair. But in 2009 it reopened again as Aman Hotel Sveti Stefan and now it’s arguably the best hotel in Montenegro. In fact, in 2010 it won Gallivanter’s Guide’s Hotel of the Year award. One of the things I love most about Sveti Stefan island is you have the feeling you’re staying in a medieval village, not a hotel. The rooms have views of cobbled streets, red tile rooftops and that unmistakable azure coastline. The vibe here calm and restful. It’s so easy to imagine you’re a world away from the buzzing Budva Riviera as you wander the quiet, cobbled lanes and dive into the crystal-clear Adriatic Sea. Inside, the old villagers’ homes have been lovingly restored to preserve character of the island. There are exposed stone walls, natural materials and just a hint of the Oriental – a nod to Aman Resorts’ Singaporean origins. Because the entire island is made up of renovated homes, no two rooms or suites are the same. Each one is unique and has its own history dating back 600 years. It truly is a one of a kind experience! In line with the village atmosphere on the island, you can head over to the Piazza, the open-air square in the centre of town, where you have the choice of the Enoteca (wine library), Taverna and Antipasti Bar. As well as the Piazza, there’s a signature Aman Restaurant on the island, which is open throughout the day for breakfast, lunch and dinner. Next to the Aman Restaurant there’s the Rakija Bar, where you can watch the lights of Budva well into the night. And the Upper Terrace and Winter Terrace are ideal places for al fresco dining in the sun all year round and have superb views of the coastline. Local'st Tip: While you're here, try the hotel's signature cocktail, which is made of rakija, elderflower extract, grenadine and villa. The food in all of the restaurants focuses on fresh, local and organic Montenegrin staples like olives, seasonal fruit and vegetables, pasture-raised beef from the north of Montenegro and fresh-caught bass, octopus and oysters from the Adriatic Sea. And as if the whole island-hotel thing isn’t special enough, crossing the isthmus to the mainland brings you to the hotel’s private pink pebble beach. There’s no jostling for towel space here. The loungers are spaced far enough apart that you’re assured complete privacy and when you want to cool off, the sea is just steps away. And if you get hungry, you don’t need to walk back to the island. Just off the beach, Olive Restaurant serves excellent Mediterranean meals. There are two pools on the island. One is on top of a cliff overlooking the Adriatic Sea and the other is by the Church of Aleksandar Nevski. Both have loungers, sea views and you can order light meals and drinks poolside. There’s a gym and six Spa Cottages on the island where you can book massage and body treatments using Aman’s exclusive chemical-free products. Accommodation on the island is only open from 1st May until 30th September, while Villa Milocer is open year round. The accommodation on the island isn’t suitable for anyone with mobility issues. There are lots of stairs, cobbled lanes and no elevators. If this might be an issue for you, Villa Milocer will be more suitable. King-size bed (you can’t add an additional bed here). TV, WiFi, sound system and safe. King-size bed in a spacious bedroom (you can add an additional bed). Some rooms have a dressing room or lounge. The Grand Suite is a one bedroom apartment that’s 110m2 and has views over Sveti Stefan village and the beach on the mainland. King-size bed in a spacious bedroom. The Grand Suite is a one bedroom apartment that’s 100m2 and has a private terrace with views of Milocer Bay. Perfect for friends and family. The Two Bedroom Grand Suite covers 170m2 over two duplex buildings that are joined by a private courtyard. There’s also a total of three terraces, two of which have views over the coastline. Large living room (ground floor). Two bedrooms with king-size beds. Three private terraces and courtyard. You can add up to two extra beds. Starting at €2,700 a night. The Adriatic Suite is a spacious one bedroom duplex suite encompassing 155m2. If you’re travelling as a family or group, you can book an interconnecting Cottage Suite. This suite has three large terraces with jaw-dropping views over the Adriatic Sea. King-size bed in spacious bedroom. Three terraces with Adriatic Sea views. The Sveti Stefan Suite is a fabulous private sanctuary unlike anything else in Montenegro. Only here can you have a private pool overlooking the Adriatic, complete privacy, spacious living areas and all within a 5*star hotel village. King-size bed in spacious bedroom and lounge. Large terrace with Adriatic views. Villa Milocer was the summer residence of Queen Marija Karadjordjevic. The villa is surrounded by Milocer Forest, which has over 800 mature olive trees as well as cyprus and pine trees. It’s a beautiful place for walking and I recommend a visit, even if you’re not staying in the resort. The rooms have larger windows and are brighter. Queen’s Beach (considered by most to be the resort’s best beach) is much closer. The spa is much closer. The villa overlooks King's Beach, which is a private beach just for hotel guests. In the neighbouring cove, you can also take a walk over to Queen’s Beach. As well as three restaurants, there’s the Living Room, Meeting Room and Library for relaxed down time. Not to mention the Aman Spa just off the beach. 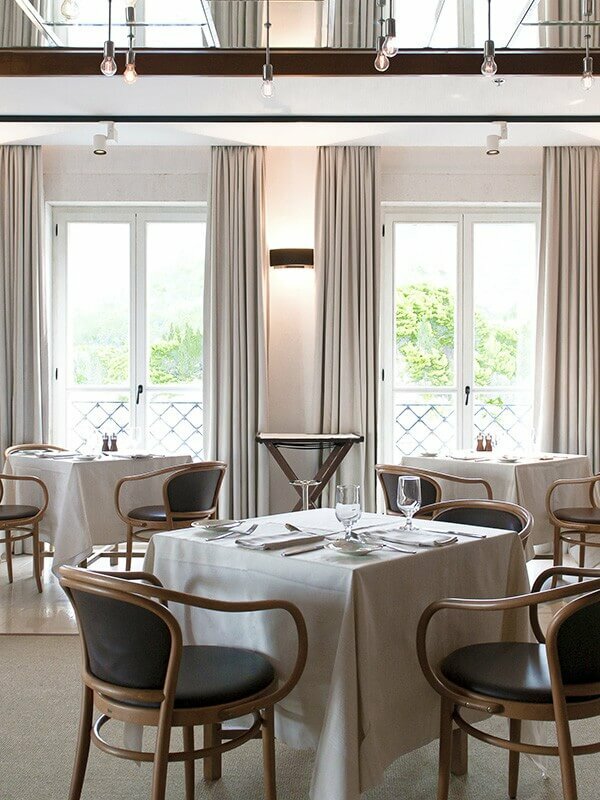 At Villa Milocer, the Dining Room is an intimate and elegant restaurant serving breakfast, lunch and dinner. 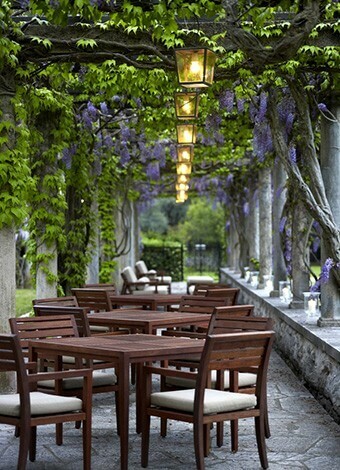 But my favourite place here, and an iconic photo spot, is the wisteria covered terrace of Loggia. The tables are lined up so you have uninterrupted sea views and dinner by candle light here is simply magical! For somewhere more relaxed during the day, you can head over to the Beach Café to grab a light meal under the olive trees. When staying at Villa Milocer, you’ve got the choice of two beaches just steps away. Immediately below the villa, King's Beach is a private beach for hotel guests only. The small cove is as private and intimate as Villa Milocer itself and a pebble beach leads down into the sea. Queen’s Beach is in the next cove and it’s the guest favourite. It’s beautiful, private and peaceful… it was also Queen Marija’s favourite beach! 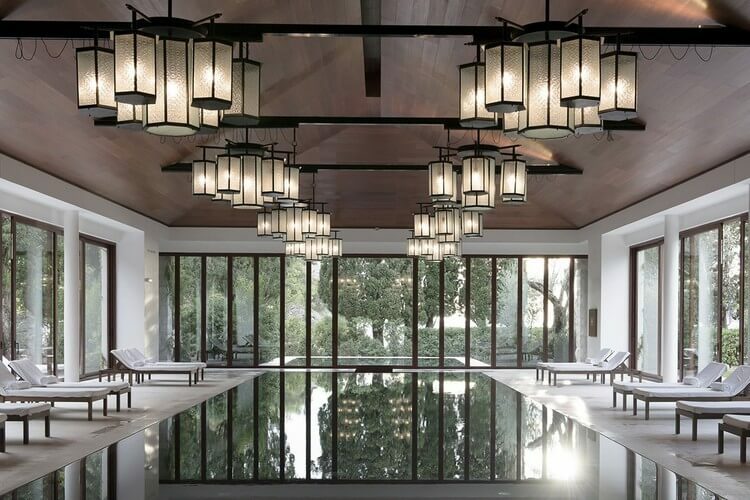 Villa Milocer’s pool is a 24m indoor pool with an 8m outdoor extension, that’s part of the Aman Spa building. The pool is surrounded by glass so you are looking out over the gardens and sea. 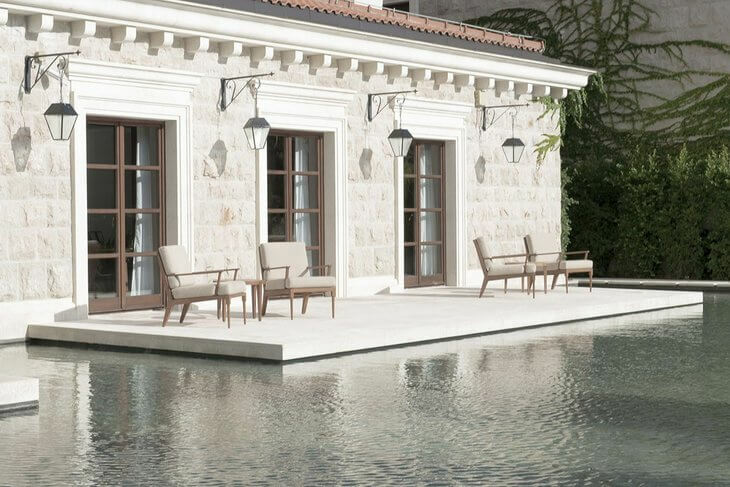 Villa Milocer has eight elegant suites in total that are perfect for a stay when the weather is cooler in Montenegro. I especially like the fire between the bedroom and living areas, which make the rooms feel even cozier. Living room with fireplace, desk and armchairs. Bathroom with shower and free-standing bathtub. You can add one additional bed. The Sea View Milocer suites are 65m2 and are the same as the Garden View Milocer suites, but overlook Milocer Beach. I would definitely recommend the sea view! These coastal views are stunning morning, noon and especially at sunset. The Queen Marija Milocer suites are in a separate building 20m from Villa Milocer and have garden views. These suites are larger than the Garden View and Sea View suites at 120 m2. The two suites here share a large ground floor terrace. Bathroom with shower and freestanding bathtub. Partial sea view through garden. You can add up to two additional beds. This is Aman Hotel Sveti Stefan’s main spa centre and it’s worth heading over here to enjoy the pool and body treatments. Guests love the treatments here and lounging in the outdoor pool looking out to sea. Aside from the large pool, there are four treatment suites and three hydrotherapy rooms, each with sauna, steam room and cold plunge pool. There’s also a gym, pilates studio and a yoga studio with sea views. 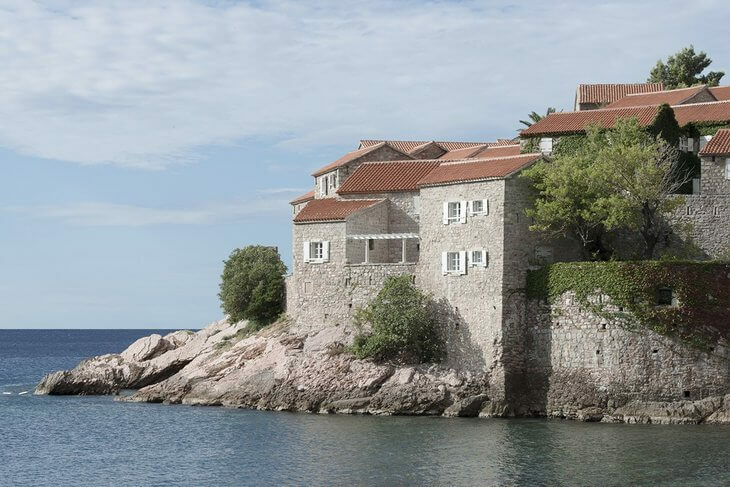 As with most of the top hotels in Montenegro, the most common customer complaint plaguing Aman Hotel Sveti Stefan is the customer service not being up to scratch. Although the hotel facilities and location are fantastic, small issues have led to guests complaining that the customer service is not up to Aman standard. Most agree that the staff try very hard, but just do not meet 5 star standards. I would agree with that. Many hotels, restaurants and tourism-based services in Montenegro fall short by global standards. I don’t want to excuse poor service (especially when you’re paying Aman prices!) but to clarify, most of these issues arise because Montenegrin staff are inexperienced with foreign tourists and don’t fully understand their expectations. Other common complaints include small windows in the Sveti Stefan Island accommodation, the food is not 5 star, spartan furnishings, no Bluetooth speakers and the pools on the island can be crowded. Some guests have said the resort doesn’t feel exclusive because the public are allowed in Milocer Forest Park, behind Villa Milocer and Queen’s Beach, although not on Sveti Stefan island itself. 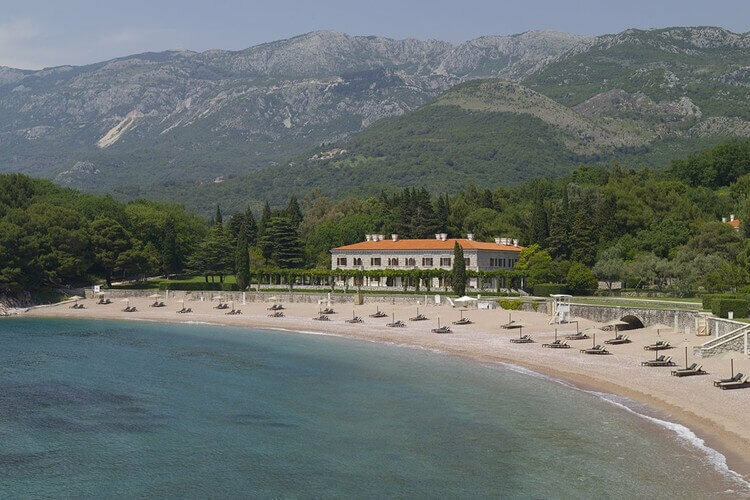 The biggest tip I can give you about Aman Hotel Sveti Stefan is: book early! To get a room here, you'll need to book several months in advance. Don't leave it until the last minute! If you'd like to make a booking, or if you just have a question about the hotel, you can fill in the form below and we'll make the reservation for you.